Welcome to the Manchester Home Entertainment Show 2010 | What Hi-Fi? 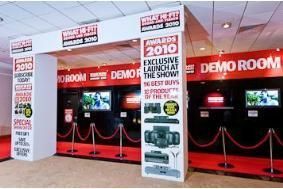 We've got treats galore in store for you, including the chance to buy our brand-new Awards 2010 issue of the magazine, see all 18 of our Products of the Year in our Awards showcase and experience for yourselves the pros and cons of 3D TV in our demo room. And don't forget to enter our amazing 2010 Awards competition, in which we're giving away £10,000 worth of Award-winning kit! Of course, we're not the only ones exhibiting here at Manchester: the major TV, hi-fi and AV manufacturers are out in force, and there'll be a host of exclusive product launches here at the show, including Arcam's long-awaited FMJ BDP100 Blu-ray player, the first UK demo of Apple's AirPlay streaming technology thanks to Denon and a bevy of new products from Harman Kardon, JBL and AKG. What's more, there are some never-to-be-repeated discount deals for this weekend only, including a £450 saving on a Pioneer home cinema combo, Samsung 3D TV offers and special Sonos bundles. All this and more awaits you at the Manchester Home Entertainment Show, so come and join us today or tomorrow. Full details in our special show blog. And if you can't make it here in person, we'll be bringing you regular news updates throughout the weekend here on whathifi.com.